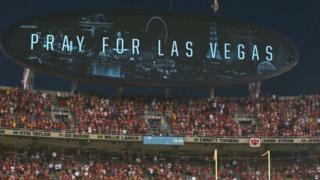 The demonstration at Monday's game against the Washington Redskins came a day after a gunman killed 59 people and wounded hundreds in Las Vegas. Fans held up signs such as one urging players, "protest on your own time". Kansas City Star newspaper sports editor Jeff Rosen tweeted: "Man, can't get behind Marcus Peters and Ukeme Eligwe sitting tonight. Flags flew at half mast at Arrowhead Field in Kansas City on Monday night, and a moment of silence was observed before the Star-Spangled Banner was sung. Sports television network ESPN had already made a decision not to show the anthem due to ongoing protests, but reportedly reversed course after the Las Vegas shooting attack. The atmosphere outside the Arrowhead stadium was rowdy and loud as fans "tailgated" before going to see their team play. But speaking to some, it was clear that many were not happy with players protesting during the national anthem. One Chiefs fan even told me he wouldn't celebrate a touchdown if a protesting player scored. Fans held up counter-protest signs including one that said: "Praying 4 Vegas - take a knee 4 the right reason". 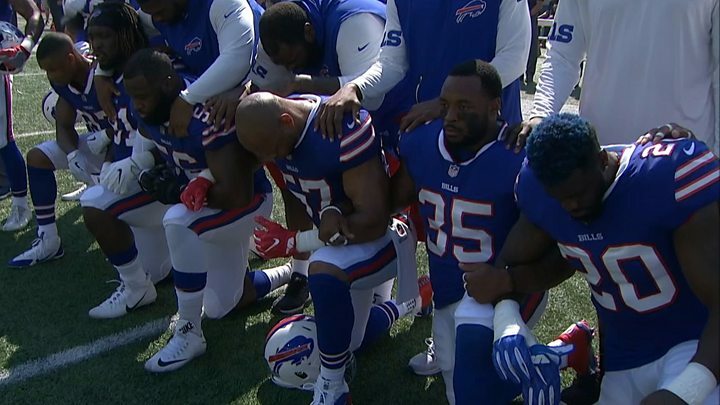 The national anthem protests began last year against police treatment of African-Americans, but took on a new lease of life after US President Donald Trump said such players should be fired. Their defenders say they have the right to free speech under the constitution. The Chiefs won 29-20 against the Redskins.